Recently released data from the Mortgage Bankers Association (MBA) shows that the share of mortgages that are considered delinquent fell. On a seasonally adjusted basis, the share of mortgages past due declined over the third quarter of 2014 by 19 basis points to 5.85%. Over the past year, the proportion of mortgages past due decreased by 66 basis points from a not seasonally adjusted level of 6.67%. The decrease over the year in the not seasonally adjusted share of mortgages past due reflected declines over each stage of delinquency. The proportion of mortgages 30-59 days past due fell by 24 basis points to 2.74% while the percentage of mortgages considered 60-89 days past due shrank by 12 basis points to 1.01%. The share of mortgages 90 or more days past due decreased 31 basis points to 2.26%. Mortgages that are 90 or more days past due are of particular importance because these mortgages are in the final stage of delinquency before defaulting, starting the foreclosure process. As Figure 1 shows, mortgages 90 or more days past due averaged 0.8% between 1980 and 2005. However, the percentage of mortgages 90 or more days past due soared during the most recent recession, peaking at 5.1% in the fourth quarter of 2009. 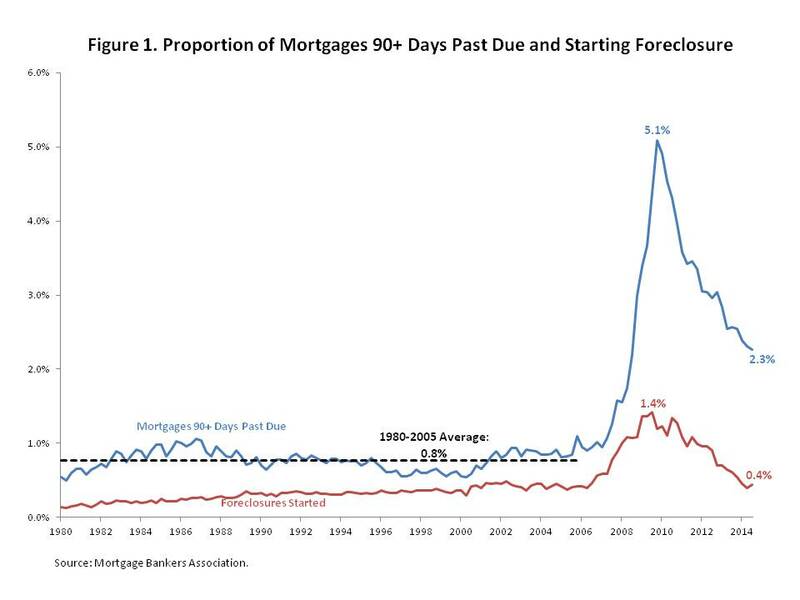 Since then, the share of mortgages 90 or more days past due has declined significantly. 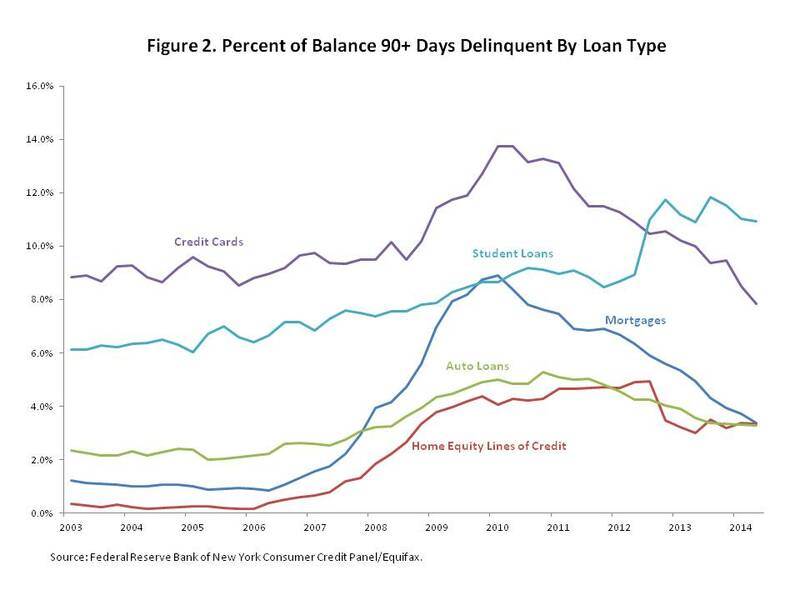 Data on household debt and credit from the Federal Reserve Bank of New York illustrates that most types of household debt have registered a decline in the proportion of balances 90 or more days past due, indicating that consumers’ balance sheets are healing. According to Figure 2, 7.8% of credit card debt held by consumers is 90 or more days delinquent, 590 basis points less than the recession-related peak of 13.7%. At its peak in the fourth quarter of 2010, 5.3% of auto loan debt was 90 or more days past due. Currently, 3.3% of auto loan debt is 90 or more days past due. At 3.3%, the proportion of home equity lines of credit 90 or more days past due is 160 basis points below its peak of 4.9%. However, the healing process may be slowed by student loan debt. According to Figure 2, after the end of the most recent recession, the percentage of student loans that are 90 or more days past due has continued to trend upward. In the third quarter of 2010, 9.2% of student loan debt was 90 or more days past due. By the end of 2012, the share of student loans 90 or more days past due reached 11.7%. In recent quarters, the share has oscillated near these highs without exhibiting a discernible decline in the trend.